20150427 - Up in the am and in to the Dr. for my face. Back home with the boys home from school for another day off school for teacher planning or paper buying... I got my prescription and then headed into work. A short day as I left a bit early to go to D's game in Grove City just a couple miles from work. L got pulled over this morning because of the dark tint on our windows we have had for the last 8 years... The day was beautiful and sunny and the afternoon turned bitterly cold... 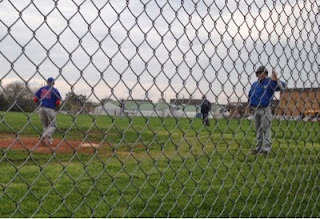 I stayed for the whole game hoping D would get in, he did not, except for coaching 1st base :-( Straight to the Scout meeting where I rescued LJ&G and we headed home. D called as soon as we got in the door so L went to pick him up as J got a shower, G played Titanfall and I got something to eat. Out to Bible Bangers with a small attendance, so a short night.